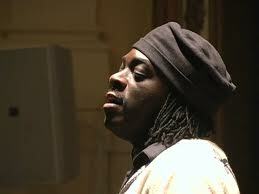 Perhaps the most electric slam poet in America, Regie Gibson (b. 1966) has, among many honors, won the 1997 money slam and the 1998 individual slam title. He and his work have been featured in the Theodore Witcher film love jones, and he has lectured and performed at venues ranging from universities to clubs across the United States and on two other continents. His performance style has often been called “rhythmistical,” signifying his weaving together of song, mysticism, the African griot tradition, and the hard funk of black American experience—a combination naturally leading to his other lives as actor, percussionist, and activist. He published Storms Beneath the Skins in 1999 (re-issued in 2001). “blooz man,” his signature piece, was featured in the 2000 Steppenwolf Theater production Words on Fire, a celebration of Chicago poetry based partly on Smokestacks and Skyscrapers, the Chicago literature anthology I edited with David Starkey. And when he performs “blooz man” and other poems where things whine, he delivers that whine like a stretched-out, twanging high note from a Hendricks guitar solo. The crowd goes wild. It’s impossible to describe in words the atomic dynamics of his performance. You’ll have to check out some YouTube videos and hope someday someone does a best-of-Regie compilation that captures a fraction of something. Start HERE, his tribute to James Marshall Hendricks. It’s only an ok approximation of Regie, but worthy of Jimi nonetheless. Yet for all its energy one realizes this tribute is an elegy, and that an elegiac mood weaves through everything Gibson does. I also included his poem “Prayer” in Black Writing from Chicago, a poem which begins: “for the drummers hands / severed before they could strike skin.” Gibson is so present as a performer, so there, but he writes so much about absent things, aborted things, things severed before their time, things going up the smokestacks of death camps. ♦ Go to a list of Black Writers on this site, and the Teaching Diversity page. ♦ Go to Black Writing from Chicago, where you can learn more and also BUY the book. This entry was posted in Black Writers, Chicago Writing and tagged Black Writing from Chicago: In the World-Not of It?, Jimi Hendricks, Regie Gibson, slam poetry, Smokestacks and Skyscrapers: An Anthology of Chicago Writing. Bookmark the permalink.